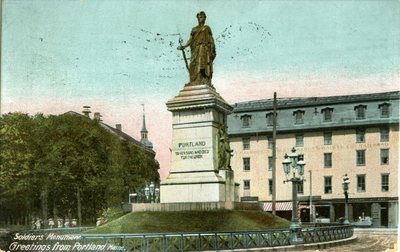 "Portland Soldiers Monument Postcard "
An image scanned from a postcard of the statue in Monument Square in the center of Portland, Maine. Additional text on the postcard indicates that the site serves as Portland's tribute "To her sons who died for the Union," and that "More than 4,000 men were enrolled from Portland in the army and navy for the War of the Rebellion. More than 300 were killed in battle and died in the service."